We have Just Sold out of Star Wars Episode VII The Force Awakens BB-8 Orange 16 Ounce Flip Straw Travel Cup. This Item is unavailable at present. From the Star Wars The Force Awakens collection by Silver Buffalo. 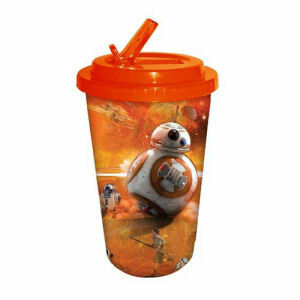 Star Wars Episode VII The Force Awakens BB-8 Orange 16 Ounce Flip Straw Travel Cup. This Star Wars Flip straw travel cup holds up to 16 ounces of liquid. Hand wash only. Not dishwasher safe. Do not microwave. Measures approximately 7-inches tall. Silver Buffalo Star Wars Coffee Mugs shipping from Canada. No Surprise Border fees or Customs!